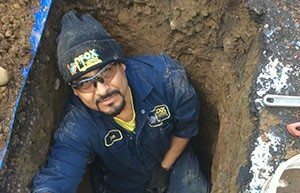 Recently, we lost a plumber in our community when a trench caved in during a side-sewer repair. This type of loss always hits home, especially with Fox Plumbing & Heating because we do sewer repairs every day. David Brown, our president and owner, makes it a point to educate every one of his crew about the importance of proper trench safety to make sure this type of tragedy never happens to any of our team as part of our ongoing education at Fox. We wanted to take a moment to reinforce why trench safety is so important when choosing a professional plumbing company to work with. Trenches are used in plumbing when repairs are needed and the pipe is located underground. Trenches can range from 1 to 20 feet or more directly down. When you have a hole over 4’feet you have to place shoring. Shoring is the process of supporting a building or trench with shores (props) when in danger of collapse or during repairs or alterations. Shoring comes from the word shore a timber or metal prop. Knowing when and how to use these techniques is why it’s so important to work with a licensed and bonded contractor. Proper shoring keeps our people and your home safe. and what happens when you don’t do trench safety properly. Professional plumbers should always be trained and competent with trenching techniques. Fox makes it a point that every trenching project we work on that we are aware of everything prior to starting a job. Keeping our crew safe is a high priority for our owner, David, because he’s worked in plumbing all of his life. And he knows better than anyone the dangers associated within our industry. While the cost of trenching is expensive, it’s necessary to ensure that we can do the job right the first time, and that it’s done the safest way possible. However, at Fox there are other options that are safer and even less costly for our friends, family and neighbors. At Fox, we try to offer our friends, family and neighbors options when they come to us. Pipe bursting is an interesting process for removing old sewer lines and replacing them with new ones. We actually locate the sewer line at the stub – where the sewer line intersects with the city – and at the home. Then we only need to dig two holes. Once that is done, we send a new line down the old line and burst it out as we go along. Below is a video that shows how the sewer pipe bursting process works. Something You Might Not Know: You are responsible for the 6 inch sewer pipe that runs from the edge of your property line to the saddle on the “main” sewer out at the street! If there are roots or any obstructions in this 6 inch pipe, you have to replace it or high pressure jet the line to try and clear the obstruction, and these types of jobs can cost upward of $10,000. Thankfully there is an option called sewer lining. Lining is a process that can save thousands of dollars on this type of repair. Fox can put a lining on the inside of the pipe that can last 50 years or more, once the roots and obstructions are cleared. Waters line repairs are even easier for Fox’s plumbing professionals, our water line expert has over 15 years of expertise in directional boring and pneumatic moling. Both of these allow for Fox’s water line repair crew to shoot a bore or mole directly down the line and then pull the new pipe through behind it. This not only makes water line replacement much quicker, but also saves your yard from having to be dug up, damaging mature landscape or having to patch concrete driveways.